LANAP - "Laser Assisted New Attachment Procedure"
Dr. Hinson is trained and fully qualified to utilize the Periolase-7 Nd:YAG laser for the treatment of periodontal disease. The procedure utilized for periodontal surgery with this laser is called LANAP, or, "Laser Assisted New Attachment Procedure," and is an approved procedure by the United States FDA. In fact, it is the only FDA approved procedure for the laser treatment of periodontal (gum) disease. The therapy utilized in this treatment involves placing the laser at the gum margin to gently open the gum tissue for access to the infected areas of the tooth and gums, thorough cleaning of the root surfaces, and a second laser treatment of the cleaned gum and tooth area to assist with healing. Compared to traditional periodontal surgical procedures, LANAP is far less invasive and patients agree that it is much less painful post operatively. 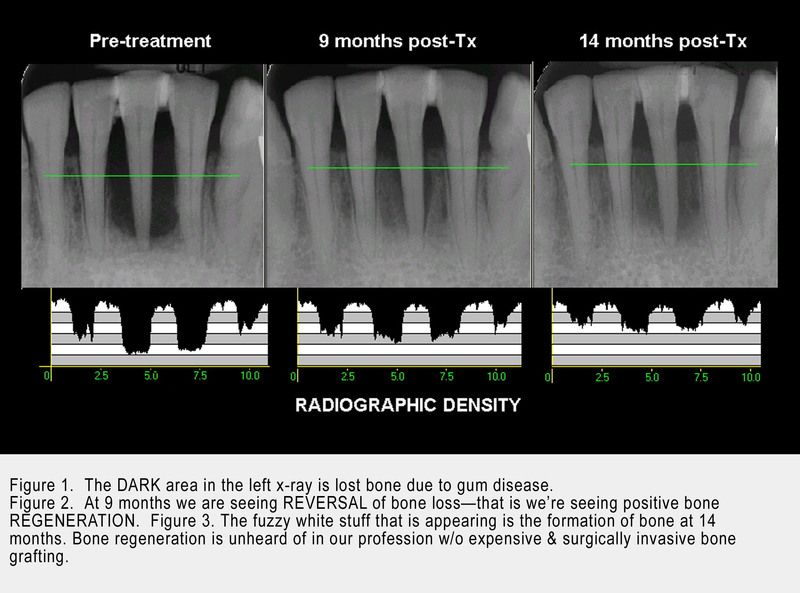 This photo, provided by Millennium Dental, is an example of how gum tissues can improve in as little as 9 days. Several studies have been concluded and several others are underway to reconfirm the effectiveness and success of the LANAP procedure using the Periolase 7 ND:YAG laser. The exciting part of the therapy is the potential for regeneration of bone. Below is a "before and after" 8-month result from a local patient showing "bone fill" to the left (behind) the last tooth. Density and volume are much improved and the area can expect to improve further over the next year.